For the average person, the word drone likely brings one of several images to mind. One of those is the Unmanned Aerial Vehicles more commonly used by the military. People with various levels of training and intelligence can now buy various versions of „copter“ drones, depending only on their budget. What logically follows are reports of people crashing their new toys (some costing $1,000 or more) into people or buildings, perhaps a testament to how little thought has gone into the idea. Even Amazon is toying with the idea of using drones to deliver orders of laundry detergent or whatever it is that a conventional courier service can’t get to you fast enough before you run out. The point is, when we think of drones, we typically think about one direction and that is up. SheerTech, a Canadian industrial design company, is about to expand our directional thinking with a nifty little device that’s sure to be a hit with the underwater diving community. It’s calling its invention the Starfish Underwater Quadradiver Robot and it won’t take you long to figure how this entirely capable device could quickly become an indispensable tool on a recreational dive boat (or any boat where fun and utility are the objective). The Starfish—we’ll shorten the name from here on—connects its human operator on the surface with a 300-foot umbilical cord (which obviously defines how deep the device will go). But as divers will already know, 300 feet is a long way down and there’s a good deal that can be done between the surface and that depth. Connected to an IPad or Android device, the Starfish is naturally buoyant (which makes the surface set-up that much easier). The four 12-volt thruster motors are used to maneuver both downward and laterally and there’s a video camera as well as a maneuverable grappling hook capable of securing items weighing up to 500 pounds before the operator pulls the Starfish to the surface. Mario Thibert, a master diver who once owned his own dive boat, is one who sees the potential of Starfish for the underwater diving community. Writing on his website Thibert (http://www.crowdfunding-reviews.com) looked at Starfish from the diver’s perspective, and applauded the idea. Thibert writes from experience, having owned a dive boat that operated on the St. Lawrence River, one of the busiest summer dive spots in the area off the province of Quebec, Canada. On the downside of that exercise, as divers well know, there’s a lot of work associated with just scouting around, not least of which is the need for a dive buddy. With Starfish, trolling for treasure would become a lot easier—and potentially a lot more profitable. Even at $2,000 per unit (the Kickstarter campaign runs until October 14) a dive community that’s accustomed to moderately hefty price tags will see the value. Indeed, Thibert admits he paid $1,500 for a tethered camera alone. 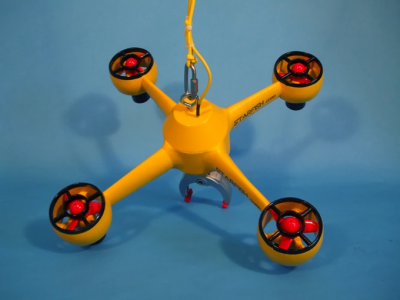 The Starfish Underwater Quadradiver Robot is featured on Kickstarter (link https://www.kickstarter.com/projects/1066181261/starfish-underwater-quadradiver-robot). Dieser Eintrag wurde veröffentlicht in Crowdfunding, Development, English, Fun, General, Hardware und verschlagwortet mit crowdfunding, underwater robot von Sebastian Trella. Permanenter Link zum Eintrag.